Both the author and illustrator live in England, but the story comes straight from the animal kingdom. A farmer finds a lost lamb in a snowstorm, and his children adopt it as a pet… Soon it’s the farmer’s dog Tess who’s watching over the baby sheep, and the two animals become great friends. 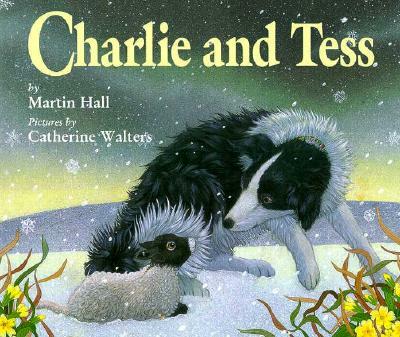 They share a doghouse and keep each other warm – and Charlie and Tess tells the charming stories about their life together. The two animals look very cozy, curled up together on a red flannel blanket. The illustrations by Catherine Walters are bright and colorful, and they offer everything you’d want in a children’s book – a happy dog, sunny days, and the excitement of new friends. There’s some fun drawings of pair in a flowery field (with mice poking their noses through stalks in the foreground). And when the farmer tosses a beach ball, both Tess and the lamb Charlie take turns chasing after it! It was Martin Hall’s first book, but there’s no need for a complicated plot. The lamb-as-a-pet angle is already enough, with the added warmth of his friendship with the farmer’s loyal dog. While Hall savors these details, he slips in an extra plot point. Charlie carries a newspaper proudly in his mouth, and the lamb even gets his own leash. “Sometimes I wonder if Charlie is turning into a dog, the children’s mother admits. And when Charlie joins the farmer’s flock of sheep, Charlie thinks it’s his job to herd them! The daughter laughs while the farmer worries, but the flowery fields keep the story colorful. “Tess was lonely without her friend, and whined every night be her doghouse,” and soon there’s an even stranger twist ultimately leads the book to a surprisingly satisfying climax. Soon there’s a big snowstorm which threatens the farmer’s entire flock of sheep. “If they didn’t move into the valley quickly it would be too late,” Charlie realizes. “He ran ahead of the flock, baaing loudly. He turned back and butted the other sheep, pulling at their wooly coats with his teeth. There’s a happy ending, since the farmer’s sheep are saved after all – and it’s Tess the dog who gets to deliver the good news. (She tugs on the farmer’s trousers and barks, then leads him to a sheltered hollow.) The farmer’s entire flock had weathered the night safely. And in the final drawing, the dog proudly licks the sheep’s fur.